Are you driving by problems in Chicago? I encourage you to read Mike Trakan's 2/27/09 blog article in which he shows maps of the neighborhoods where four Chicago school kids were killed in the past week. Mike works for me, and thus his maps and articles are intended to help further the Tutor/Mentor Connection's goals. In this article, Mike points to the lack of tutor/mentor programs, and the role the media can take to keep attention on all of these neighborhoods, so we draw more resources into the neighborhood to help tutor/mentor programs grow, and then we use those programs to help kids connect with a wider range of adults who can mentor different choices and aspirations than what kids see everyday in the neighborhood. 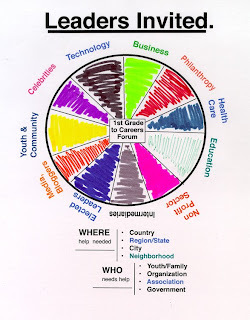 Yesterday I used a Village Map graphic to illustrate the need to draw people from many different backgrounds and business sectors into this strategy of helping kids from poor neighborhoods go through school and into college and careers. While it may take years for a tutor/mentor program to change the thinking of kids in a neighborhood, nothing will ever happen for poor kids unless we educate the adults who drive by poverty every day, read about it's impact in the newspapers, but are not personally connected, so only are involved with random acts of kindness. I keep saying, "If these were your kids, wouldn't you do more?" 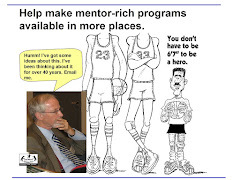 They are "other people's kids" and involvement in one-on-one tutoring/mentoring is one strategy that can change that. 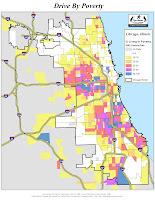 The map on this article shows how Chicago's major expressways bring millions of people through poverty neighborhoods and into the city every day. Imagine a virtual sign over each expressway saying "visit here for a few hours a week". Through our blogs, maps, media stories and the role of many leaders, we need to educate those not living in poverty of all the ways they can "visit for a few hours" and give time, talent and dollars to help kids in these neighborhoods have different futures than what is now available to them. You can help by passing these articles on to others and by setting up a learning circle in your family, business, hospital, professional or social group. Use the articles on the Tutor/Mentor Institute, and in these blogs, as part of your discussion material. You'll find that as you understand this information you'll see many paths to greater involvement and greater impact. I attended a forum this morning hosted by Voices for Illinois Children in which the 2009 Illinois Kids Count Report was distributed. The focus of this year's report was the growing gaps between rich and poor and good schools and poorly performing schools in Illinois. The statistics can be seen in the report. They are appalling. I've seen them before. The focus of today's symposium, and this year's Kids Count is to go beyond traditional thinking to innovate new ways to help kids get through school and into adult lives. A variety of panel members spoke. Judy Erwin, of the Illinois Board of Higher Education, was part of the morning panel, and she said "we need to look at a continuum of learning; we need to get out of our silos". I agree. The graphic on this page represents some of the different silos that need to be connected in a learning process that focuses adults on the type of reports that are produced by Illinois Kids Count, and which you can read in the T/MC links library. We need an adult learning process, that builds public and private sector investment in solutions to this complex problem. I created the graphic above using a concept map tool and I've had it on my site for a while. It means something to me, but maybe not to most people. Thus, I was pleased this week to have two graduate students from the University of Michigan School of Information spend their spring break with my organization in Chicago. They decided to animate this village map, in order to help people better understand the idea behind it. You can view their project here. You can meet Malhar Gupta and Garima Garg and read more about their work on this project in the T/MC Ning page. I could not have created this animation on my own. But I've been reaching out to graduate schools to help me convert my ideas into animation, and this year was the second year we've had students from the University of Michigan work with us. We actually had a third student this week, and I'll write about his project next week. You can meet our technology interns on line and if you like what you see and want to get your university involved, just introduce yourself on the Ning.com site. Last night in his speech to the nation, President Obama read a letter from a little girl. "Gang violence is a huge problem in the community today. People are getting killed left and right for these unnecessary reasons. There are drive-by-shootings, gang wars, and people getting jumped and beat up for having their hat tilt to the wrong side. Innocent youngsters are dying and getting hurt for something they did not cause or have any notice of. The solution is getting these “wanna-be-gangsters” off the streets. Provide more programs for them to be doing something more productive. After-school programs only go up to 13-14 years of age then just drop kids off out on the streets. There has to be a better way to go about this. You can read these letters here, and here. At http://mappingforjustice.blogspot.com you can find maps showing where there are poorly performing schools and high concentrations of poverty. You can see some showing where shootings took place. These are areas where volunteer-based tutor/mentor programs can make a difference, if they exist. In some place there are programs, and we provide contact information via a searchable program locator database, so people who want to help President Obama keep his promises can offer time, talent and dollars to these specific programs. In other places there are no programs, which means the businesses, faith groups, colleges and hospitals could be taking leadership roles to help new programs start and to help all programs in a neighborhood grow. 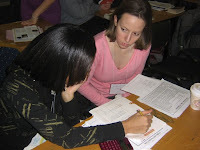 The information on the Tutor/Mentor Connection web sites is intended to help businesses and non profits learn from each other, so that they can become more strategic and connected in how they help tutor/mentor programs connect with youth in many neighborhoods of Chicago and other cities. Our role is to mentor this process, to help people find and use the information. Contact the Tutor/Mentor Connection or join our Ning group if you'd like our help. I encourage you to read this article, titled "Raisin’ the Buzz: At the table with Dan Bassill", written and posted By Sidney Hargrove, who is a program officer with a community foundation in Columbus, Ohio. Thanks Sidney for helping us tell our story. Today was the final day for our two interns from Illinois Institute of Technology to serve with Cabrini Connections. Rack and Alan both posted reflections which show how they have gained from the six weeks with us. As you read their reflections view the work they did and you'll see how much we gained as well. Alan created an animated version of the T/MC strategy map which you can view here and in the menu bar of the Tutor/Mentor Institute. While Alan and Rack are leaving today, we are welcoming three new interns from the University of Michigan. They are graduate students from India and Korea who are part of the School of Information's Alternative Spring Break program. Through this program we're getting high level talent to help us visualize our strategies. Through their blog articles, we're being introduced to others from the University of Michigan network who might help us. You'll be able to meet Taeho, Garima and Malhar on the T/MC Ning page. On Chris Warrens blog he has written about networking with a purpose. This graphic illustrates what this means. If you are the RED dot, then if you pass on this blog message to people you know who are in business, faith groups, hospitals, etc., you have expanded our network. If you go beyond that to hosting "learning circles", like a Bible Study class, to help members of your network learn where tutor/mentor programs are needed, why they are needed, and what ways members of your group can provide time, talent, and dollars to help one or more programs grow, then you are building the network. This is an intentional, and active role. I've been creating graphics like this for almost 10 years to try to convey these ideas. As they say, "a picture is worth a thousand words". In the past few years I've had interns join me from Korea, Hong Kong, the University of Michigan, Illinois Institute of Technology, Indiana University, etc. who have created animated graphics to communicate these ideas. I encourage you to visit the Korea Group on our Ning site to see work that has been created in the past few weeks. In the discussion forum on the T/MC site you can learn about other forms of service learning, and the work of other interns. For example, this week we'll have three students from the University of Michigan Alternative Spring Break Program. One is from Korea and two are from India. Thus, the ideas they bring are from different parts of the world, and the ideas we share will go with them to different parts of the world. The work that will be created will help us communicate complex ideas in ways that make it easy for leaders to read, and hopefully, adopt these in their own actions. This will bring more consistent support to volunteer-based tutor/mentor programs in Chicago and other cities, and hopefully to the Tutor/Mentor Connection as well. In the end, the work we do is intended to help kids who are entering first grade today, be in a job or career by age 25. This is a long term project that needs to be happening at the same time in thousands of locations. This requires on-going support. Since non profits are not good at advertising, and not all are good at fund raising, we need to reverse the system, and educate donors and volunteers to shop maps to choose where to get involved. One group of interns that we have not yet recruited are those in business schools around the country. These students are learning marketing, advertising and communications. Why not apply that learning to drawing resources to volunteer-based tutor/mentor programs in the home city of the university? This is an idea we express in the Business School Connection. While we have this on a wiki, this is an idea that could be converted into a visualization by one of the interns with us next week, or by a student group in Europe, Asia or Australia. The ideas expressed above are network-building ideas. They are seeds that I plant in order to mobilize resources and partners who will spread these seeds to more places where they take root in various forms of leadership aimed at helping kids move through school and into careers. Earlier this month I wrote an article about social networking with a purpose. Chris Warren, our Public Interest Fellow from Northwestern wrote a follow up article on this topic, titled "Who's in your Network?" If we each try to connect people from our networks with tutor/mentor programs, where they can donate time, talent and dollars, we help these programs expand their own range of support, and sustain their services during this economic nightmare. As you socialize this weekend, or attend religious services, think of ways you and point the people you talk with to places where they can help us help inner city kids. Have Fun. Do Good. Save the Date! Read about Jimmy Biggs, and his vision of mobilizing 100 business leaders who give time, talent and dollars to support Cabrini Connections and the Tutor/Mentor Connection. The July 16, 2009 Jimmy Biggs Memorial Cabrini Connections Golf Benefit is a time and place where these leaders connect, socialize, and show their commitment with the donations they make. Be one of those leaders and help raise the funds needed to continue this work in 2009. In encourage you to read Mike Trakan's article about the shooting of 16 year old Johnel Ford at about 4:30 p.m. on February 12, 2009. Mike works for me at the Tutor/Mentor Connection, making maps that are intended to help tutor/mentor programs grow in areas where there is too much violence, too much poverty and too many poorly performing schools. With each map Mike creates, he writes an article that shows how businesses, churches, politicians and others in the area of the shooting could work together to help tutor/mentor programs grow and serve kids in that part of the city. He points two two programs which we have listed in our database. 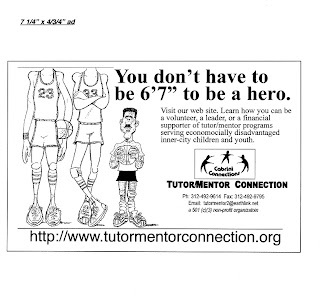 One is the Arab-American Youth Program and it's web site says they offer tutoring/mentoring. Mike points out that it's difficult to know how much of an emphasis this is from the information on the web site. The other program listed is a church based program. We're not quite sure what scale of program this is because they don't seem to have a web site, and we've not had contact from them to update the information we have. If you know anything about this program, please contact us. These are the only two listings we show in an area with several thousand young people. 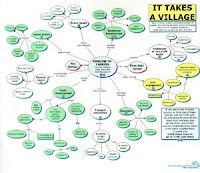 There should be more and Mike shows how people could be using T/MC maps to think about who could be involved in helping more programs grow in the area. We post links to more than 200 web sites in the Chicago program Links section. Not all of the web sites are great. But some, do a wonderful job of showing what a program offers. Our goal is to teach program leaders, educators, and donors to use these sites to collect good ideas of what is happening in some places, which could be happening in many places, if only the volunteers, dollars and leaders would be available. Here's an example. This is a blog managed by a volunteer with Cabrini Connections. It shows how a couple of volunteers are working with a few teens to teach them uses of technology. In today's post they are demonstrating lessons learned in the past week. Imagine if businesses and faith groups were helping recruit volunteers for programs in the area where this last shooting took place, or in other neighborhoods of the city with poorly performing schools. This could be happening if our leaders and media would just write some stories and encourage it to happen when ever they are reporting bad news. Tell the REST OF THE STORY. Show the good news that can happen. PS: Visit the NICE Network on Ning and join this week's mentoring discussion. Last Thursday I posted a map that Mike Traken of the Tutor/Mentor Connection created, showing the distribution of $217,000 in grants to volunteer-based tutor/mentor programs in Chicago by the SunTimes Marovitz Lawyers Lend A Hand to Youth Program. Over the weekend Mike wrote a blog post showing the 2008 and 2007 distribution of Lend A Hand Grants, and doing an analysis to help all donors innovate strategies that not only provide continued funding to many programs, but also expand the range of funding, so a larger percent of all of the volunteer-based tutor/mentor programs in the city are getting the operating dollars they need on a continuing basis. A week earlier Mike had written an article showing how businesses, faith groups, hospitals and universities in the 9th Legislative District of the Illinois Legislature could be working together to fuel the growth of tutor/mentor programs in that district. Wouldn't it be great if the newspapers were writing articles about collaborations such as this, instead of articles about graft and corruption among state and local elected representatives? In the face of the economic crisis that is challenging non profits to do more with less money, one hero organization deserves recognition. It's the SunTimes Marovitz Lawyers Lend A Hand to Youth program, which awarded $217,000 in grants to 27 different Chicago tutor/mentor programs in December 2008. 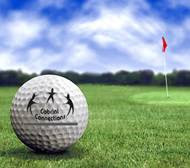 Cabrini Connections received a grant to support its one-on-one tutor/mentor program serving 7th to 12th grade teens. The Tutor/Mentor Connection received a grant to support its efforts to build capacity in tutor/mentor programs throughout the region. We've been a part of the Lend A Hand's growth since 1994 and have written often of the good work they are doing. This photo shows Dan Bassill receiving 2008 grant from Genita Robinson, the new Executive Director of Lawyers Lend A Hand. Our aim is to help Lend A Hand raise the funds they award, and to encourage other industries to duplicate their efforts so that every tutor/mentor program would have multiple streams of revenue and sources of volunteers, which assures continuity of service and constant improvement of impact. Thus, I encourage you to visit the LAH web site and read about the Eighth Annual Barristers Big Band Benefit Ball which will be Saturday, March 14, 2009. By participating in this event, or sending a donation, you help provide the dollars that fuel work at many tutor/mentor programs in Chicago. In my previous post I wrote about the volunteer recruitment event hosted last evening by WomenOnCall.org. My hope is that the business and professional women recruited by one organization will duplicate the Lend A Hand effort, in their own industry and that this total effort will be duplicated in other cities all over the country. Without your help it will be difficult to find the dollars to sustain these programs, let alone help new programs grow in areas of Chicago that did not receive 2008 Lend A Hand grants, partly because there are few volunteer-based tutor/mentor programs operating in those areas, or because we don't yet know who those programs are. If you know of volunteer-based tutor/mentor programs in the areas of this map where we don't show any grants being awarded, please forward contact information to the Tutor/Mentor Connection, and the Lend A Hand Program, so we can add them into our umbrella of support. Last night I attended an volunteer recruitment and networking event hosted by WomenOnCall.org. This organization hosts a web portal that seeks to mobilize women who have been successful in business and other careers as volunteers in non-profit organizations throughout the Chicago region. The guest speaker was Sheli Z. Rosenberg, who has been hugely successful in her business career. I searched Google to find a link to go with this, and one shows the network of people and organizations connected to Ms. Rosenberg. During her remarks Ms. Rosenberg talked of how successful women have an "obligation to give back." She emphasized the core values of WomenOnCall when she said "Non profit organizations don't have access to the type of skills that highly successful professional women have to offer" and that "volunteers can make short, small commitments, that have a big impact." She referred to a book written by former Secretary of State Madeline Albright has written in which she said ""There's a place in Hell reserved for women who don't help other women." She concluded by saying "If we don't make life better now, our kids and grandkids will have the same mountains to climb." This is exactly what I've been saying for years and it is great to hear people with a much more influential network than mine give the same message. Now my hope is that such leaders will take an active role in the forum created by WomenOnCall, and where ever they have such opportunities, to not only call on people to give their time and talent, but to also give their dollars. 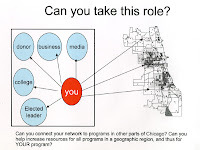 This will lead volunteers and donors to volunteer-based charities serving all social sector issues, but will also lead them to the Tutor/Mentor Connection, where they will use our maps and program locator to search out leadership and volunteer opportunities in all parts of the Chicago region, and with the T/MC itself. There are three articles I encourage you to read. Social Edge discussion - Issue Fatigue - what does it take to keep donors and volunteers and leaders focused on your cause? In the Tutor/Mentor Institute we post a variety of essays with charts illustrating that it takes 12 years for a youth to go from 1st grade to 12th grade graduation. Sounds like a simple idea. Yet there is very little public policy, or leadership, that keeps donors and volunteers focused on non-school tutor/mentor programs on a consistent basis that it takes for the kids we serve to finish high school, let alone finish college, or have volunteers helping them get job interviews when they are in their 20s. Non profits who engage volunteers and connect them with kids are providing many services, not the least is that they provide jobs! While the government may not include us in the stimulus package, volunteers who are part of tutor/mentor programs, serving on boards, or who have been mentored by someone in their journey to a job, can build their own stimulus strategy, distributing funds that not only sustain existing programs, but which enable programs to add new talent from among all of the people who are out of work. While building a bridge might employee many people, it might take a year or more for the project to be off the ground. Send me $60,000 today and I can hire and provide health benefits for two more people to help me at Cabrini Connections. Send the same money to many of the other Tutor/Mentor programs listed in Chicago Programs Link and you get the same immediate impact. You say this is not possible? Look at Lawyers Lend A Hand and you'll see that they have raised new money and awarded grants of $217,000 in 2008 and $240,000 in 2007. One of these enabled us to employ a full time coordinator for the Tutor/Mentor Connection, which is enabling us to bring more programs together and do more to maintain the database that we point parents, volunteers and donors to so they can help tutor/mentor programs in all of Chicago. For us to keep this position in 2009, the stimulus package you provide needs to provide the dollars for us to do this. Isn't that what this is all about? So Many Years. So Little Change. I attended a symposium at Loyola University In Chicago on Friday, under the title of "Separate and Unequal? The Socioeconomic Realities of Public Education in America"
The first speaker was Veronica Anderson of CATALYST which has been hosting school policy forums that I've written about in the past few months. I encourage you to visit their web site and listen to the recordings of these. Veronica talked about Charles Payne's book, "So Much Reform, So Little Change"
I encourage you to visit these sites and read some of the research showing that 77% of the kids in Illinois get an inadequate education, and poor and minority kids fare much worse. So, why is this happening after so many years and so much funding? Is the issue funding, or is the issue CLASS AND RACISM? Is this an issue of leadership and morality? Ralph Martire, Executive Director for the Center for Tax and Budget Accountability was a speaker. I've followed his work for many years. He makes a strong case for tax increases. However, he said, "it won't happen" because "it's not a question of logic, but one of BUMPER STICKER POLITICS". What he means is that when any elected official says "I'll increase taxes" to pay for something we all know is needed, someone will run against that person saying "HE RAISED YOUR TAXES". Thus, until we create the public will in thousands of people in Illinois to support law makers who provide the funding needed to educate ALL of Illinois' kids and make sure businesses want to locate in this state because of the quality of the workforce, the quality of schools, and the low costs of poverty, we will continue to reap the negative benefits of what actions we do not take. I support volunteer-based tutor/mentor programs because they connect people who don't live in poverty, and don't share the same racial/ethnic/social economic background as most people who do live in poverty, with kids and families and schools that do have this challenge at the root of every problem in their daily lives. I've seen volunteers transformed as they became involved with the youth they mentor and seen how many of these volunteers go to great lengths to help the child. Some even become leaders, donors, board members, and advocates, such as myself. Increase the number of programs like Cabrini Connections who engage 70 to 100 workplace volunteers with inner city kids each year, and help these programs nurture and educate the volunteers so they do more to help the kids, the programs, and ultimately, the schools and legislators, and we'll build the PUBLIC WILL POWER that is missing in these discussions of education. This is a marketing challenge, where the education we provide is directed at adults who need to be more responsible, not just the kids, families and teachers who are living in high poverty neighborhoods. Help us do this work. Be the CHANGE. 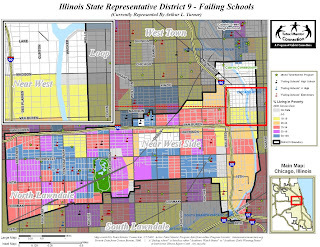 A new set of maps has been posted on the MappingforJustice blog, showing the need for volunteer-based tutor/mentor programs in the Illinois 9th Legislative District. 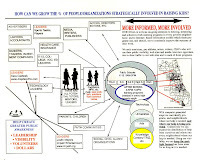 Read the article and see how these maps can be used by leaders from business, universities, faith groups, hospitals, non profits and political organizations to support the operations of programs that help kids to careers in this district. I want to thank Paul Mondesire for writing an article for THE LOOP, describing the role of the Tutor/Mentor Connection, titled "How Connecting People Increases Power". I hope you'll all read the article and use this information as Paul is recommending. An article came across my desk this morning with the headline of "Teens prepared for math, science careers, yet lack mentors". The maps we post at MappingforJustice.blogspot.com show the high poverty areas in Chicago and locations of poorly performing school. You can use the Program Locator to search by zip code for contact information of volunteer-based tutoring and/or mentoring programs in different parts of the city. Thus, if you're someone who agrees with the MIT article about math mentors, and who has a math/science background, why not give some time as a mentor and tutor in one of these tutor/mentor programs. Better yet, why not help new programs grow where none now exist? 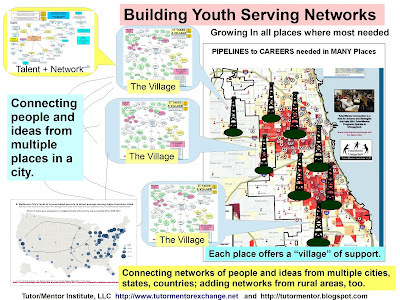 If you're an alumni of MIT, or University of Chicago, or Northwestern, and thinking of where to put a $300 million donation, why not donate it to groups who can build an infrastructure of non-school volunteer-based tutor/mentor programs serving inner city kids and with goals reflected in this strategy map.